over 1,000,000 Custom DogTags Sold! You can pay by using our secure server. You can print your order to pay by MAIL or FAX at CHECKOUT. You can also pay by at CHECKOUT. The DogTagsOnline website is now SSL encrypted and secured to protect you and your personal information. So Heavy Duty and durable we can offer a LIFETIME WARRANTY. Price, quality, fast delivery, and service, others can't match! DogTagsOnline is proud to be recognized as the leading custom dogtag site on the Internet. We have successfully sold more than 1,000,000 military identification tags and pet id tags in the 20 years we have been in business. We are committed to making sure that we provide our customers with fast delivery, friendly customer service, quality products, and cheap prices. We manufacture regular identification tags and pet id tags seven days a week and ship our products out six days a week. When you order with a credit card, we can usually have your order shipped either the same day or the next. No matter what, you can rest easy knowing that your order is being shipped to you as quickly as possible. DogTagsOnline is committed to providing every one of our customers with highest quality dog tags at the lowest prices possible. Not only that, but we also offer personalized dogtags to perfectly suit your specific needs. No matter how small or how large your order might be, we can create the perfect dogtag just for you. These are not cheap dogtags...we use only top quality materials designed for heavy duty use and durability. If you have to ask, "What goes on your dog tags?" or "What is on a dog tag? ", you have come to the right place. 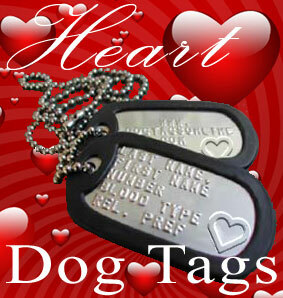 We are the leading dogtag and humdreds of pet tag site on the Internet. DogTagsOnline has sold over 1,000,000 military ID tags and pet id tags in our 20 years in business and our hundreds of thousands of satisfied customers will attest to our high quality, low prices, quick delivery, and friendly personalized service. What are military dog tags made of? We sell the same high quality custom stainless steel military ID tags and beaded necklace chains that are selling for more than twice the price at some other dogtag sites. We produce 7 days a week and ship 6 days a week by USPS First Class, USPS Priority Mail, and USPS Express Mail, and credit card orders are generally shipped the same day or next day. Use our simple line by line military dogtag generator to create your own genuine Army, Navy, Air Force, and Marine ID tags with the correct current military dog id tags format. You can see the finished product before you order them to assure accuracy and appearance. You can use the most advanced Military DogTag Generator available on the Internet to design, customize, verify your text, and order your own genuine military id tags. Line by line instructions will guide you to make current issue regulation ID tags with the exact military text format and spacing used by soldiers in each branch of the US Armed Forces. Our Generator allows you to See Them Before you buy them. To make sure that our product is authentic, we make each and every one of our tags on our genuine ID tags sets utilizing the exact same dogtag machines that are used by the U.S. Army, Air Force, Marine Corps, and Navy. Whenever you order a custom ID tag, it will have a 1/8” embossed(raised) text, similar to what you see on your credit card. In addition to our regular and personalized tags, we also sell vintage stamped army tags exactly like those that were used in World War 2, the Korean War, and Vietnam. These dogtags have stamped or indented text and are harder to read than the modern embossed text. Whichever design you choose we will be more than happy to include a different individual text on these tags at no extra charge to you. 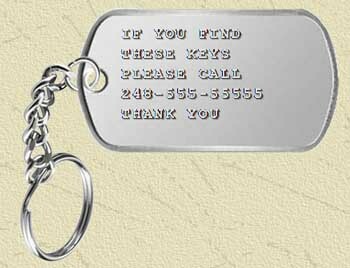 In addition to military tags and dogtags for men, women and children, we can also create custom dogtags for any occasion or any special need you have. We have over 100 text samples you can take and personalize and customize to make your dogtags your own. We have 4 different styles of medic alert tags and over 20 examples of texts for ICE or In Case of Emergency Contact dogtags that you can customize to protect you and your family. We also offer customized dogtags for school and college sports teams, marching bands, and can also be used as sorority and fraternity pledge and member id tags. Paintball and airsoft dogtags for your MILSIM team, paintball tournament, or as paintball birthday party invitations and birthday party favors. Grab any of the multiple text samples provided and personalize and customize your ID tags to be the envy of your paintball friends. Personalized engraved dogtags are available in your choice of 6 anodized aluminum colors and 15 dogtag silencer colors. 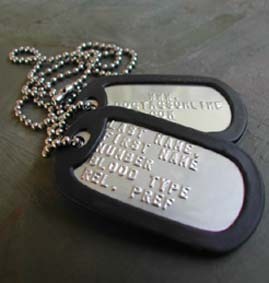 Express yourself with up to 10 lines of text on these dogtags engraved on 2 sides with up to 5 lines of text per side. These engraved dog tags also make ideal medical alert dogtags that can hold your complete medication list and dosages. Romantic dogtags for your loved ones, family dog tags for men, women, and children, and even brass dogtags to use as Purple Heart mementos for your family soldiers. No matter what you might need ID tags for, let us know what you have in mind and we will do everything that we can to exceed your expectations. A DogTag for Every Occasion! One Stop Shopping! Our Bulk DogTag Generator(Fast Quote)is the only online system that allows you to get a quote for your order, enter your dogtag texts, make your payment, and have your dogtags in hand within 5 days. Every dogtag can have all the SAME or all DIFFERENT text or any combination of both. You can add accesories to your order from our large selection of sdog tag silencers and stainless steel connecting hardware including necklace chains, short chains, split rings, keychains, key clips, and more. We discount large wholesale bulk dogtag orders...the more you buy the less you pay per set. If you will be buying wholesale or bulk dog tags, be sure to check out our Fast Quote tool while you are here at our website. Shop here for your keychain online that is made from a real military dogtag attached to your choice of a key ring, key clip, or key chain. These personalized keychains will keep your keys organized and will help get your keys returned should they get lost. These cool keychains, equipped with a key clip, can also be used as key tags to help organize your keys. NOTE: Home phone numbers should not be used as they can be searched online to locate your house. Use a cell phone or business number that cannot be traced online to your address. Keychain Bottle Opener - Save your hands from twist offs by keeping this bottle opener handy on your keychain. 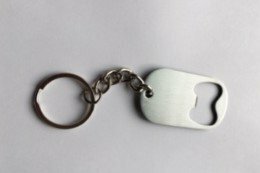 This stainless steel bottle opener and keychain is made Military Tough and is so strong we can offer these with a “Lifetime Guarantee”. Pet Tags Online offers most advanced custom pet id tags generator on the Internet. You can see exactly what your dogtags for pets will look like before you buy them. This generator will automatically resize the engraved text on your dog and cat tags to fit on the id tag and automatically center your pet’s name on one side and your name, address, and phone numbers on the other side. Most dogs and cats never leave the neighborhood so your neighbors won’t need a microchip reader to return your lost cat or dog. Anodized Pet ID Tags - Available in 5 shapes including dog bone, round, heart, hydrant, and octagon shaped engraved pet id tags. Most of these pet tag shapes are available in monster, large, and small sizes and available in 5 colors including blue, red, black, green, and purple. These are not cheap pet id tags…they are thicker than the typical pet id tag and are anodized on all surfaces, even the edges. 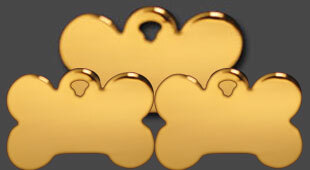 Gold Pet ID Tags - We also offer gold pet id tags for dogs and cats that are gold plated on all surfaces and are available in 5 shapes and most in 2 sizes. Your gold tag for dog or cat has 2-sided engraving with your pet’s name and address along with your phones numbers to help get your lost pet returned. Add a little bling to your pampered dogs and cats. Stainless Steel Pet Name Tags and Brass Pet ID Tags - Brass or Stainless steel pet id tags made from genuine military dogtags. These custom pet id tags are made Army Tough and have the text deeply embossed so that it will never wear off like engraved pet id tags. The brass and stainless steel id tags are available with a silicone rubber but they are not recommended as they are hard to keep on. Our‘No Hassle’ Money Back Guarantee! DogTagsOnline is a BBB-accredited business with an A+ rating that specializes in customized dogtag sets for only $6.99 for a complete 6-piece military set. All our dogtag products come with our ‘No Hassle’ Money Back Guarantee because we like happy customers. Do not hesitate to get in touch with us if you would like more information about bulk orders, free shipping or if you have any other questions about our quality military tags. We look forward to serving you!